Arabs should Listen more than dance.! Their achievements helped establish the modern chaabi music in Morocco in a way that they were among the first to play Moroccan pop music using western instruments, hence setting the rules for the genre. Lemchaheb, or the "The Torches", also hailed from Hay el Mohammadi in Casablanca. The band was started by Moulay Cherif Lamrani who approached Mohamed Bakhti, a friend of Nass el Ghiwane, about starting a similar band in 1973. Moulay Cherif had a father who was conducting bands in Oran on the lute. He learned a lot from his father as well as from the Oujda Conservatory of Music. His first band was something similar to the Oujda band, Ikouane Migri (Migri Brothers) who were playing western pop music, and had drums, guitar, bass and keyboards. The first Lemchaheb line-up consisted of Moulay Cherif, the Bahiri brothers (ex-Tyour el Ghorba) and a young girl Saida Birouk. They released an EP of four songs and gained notice. The Bahiri brothers changed course and it was time to hire new recruits. First was Mohamed Batma (brother of Laarbi Batma) and his longtime friend Mohamed Sousdi, then Hassani-poet Mbarek Chadili. Hence, the first official lineup was formed by Mbarek Chadili, Moulay Cherif Lamrani, Mohamed Sousdi, Mohamed Batma and his wife Birouk Saida around 1975. Their infectious melodies soon took hold of a large portion of listeners. 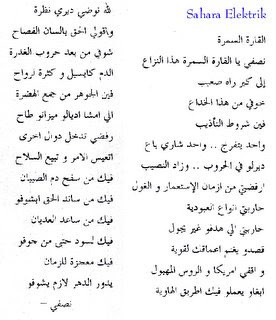 By the end of the seventies it was hard not to sing along songs such as Khiala, Dawini, Denia Allah, Khayi, El Oued (El Ghadi B'id), Amana and Attaleb. Saida left the music scene shortly after and Mohamed Hammadi joined. Other classics came in, such as Meddahou, Ya Chra' and Yahli. In the early 80's, Chadili left and they hired Noujoum Ouazza on the electric guitar. His sound is very distinctive; a clear toned electric with a chorus+flanger effect. He added a dreamy sound that complemented Lamrani's acoustic mandolin. His impact on the band is still present in the band's sound; the flanger effect that he used became a trademark. Even Lamrani adopted later an acoustic mandolin but with an electric pickup and a light flanger effect. This short-lived line-up would rework some old songs and also write new songs of its own. Who could forget Moualna, Tbaye' Annass, and Khlili? After receiving an offer from the German World Fusion band Dissidenten to join them on their album, Lamrani left the band temporarily and brought Chadili with him to Germany. They wrote and played the already classic material featured on Sahara Elektrik. Meanwhile, Noujoum took complete control of string duties, and Chadili and Lamrani released some solo albums when not playing with Lemchaheb. This period of Lemchaheb was very mediocre compared to their previous years. They started including electronic drums like Jil Jilala and released awful albums like Tab'i Rebbani, Majnoun Had el 'Alam and Ibda'ate Khalida. These albums nonetheless contained some real standout tracks like Goubail Dehmiss, Lgara and Tfada Ya Louglib. Noujoum left Lemchaheb to become a full-time member of the Dissidenten live line-up. And with Lamrani back on the mandolin, they release T'ala a Bouya Tchouf and Ya Latif. These two albums contained such great tunes like Youm Kounti M'aya, Dounia Allah (II), Ya Latif, and the epic Al Jounoud. After taking a hiatus in the mid-90's, they came back with a stream load of albums. They did however update their sound: they started incorporating elements of modern music such as drums, bass and keyboards. But fans of Lemchaheb need not worry, the basic elements were still there; the symbolic voices of Sousdi and Batma, the high wails of Hammadi and Chadili and of course the mandolin of Lamrani were still in good shape. Great songs like A'tini Mnin Na'ti Yal 'Ati, Zenzen ya Nhel, Koura ya Ard were made as well as Dounia which is a tribute to Laarbi Batma. They also updated a lot of their timeless classic with their new sound. Batma died in 2002 and Lamrani died in October 2004. The future of Lemchaheb is uncertain.